The bedrooms are simply furnished. 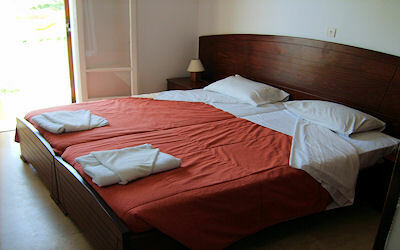 One with a double bed and one with twin beds. Each has bedside table, dressing table and large wardrobe. They are also equipped with Satellite TV and Air Conditioning. 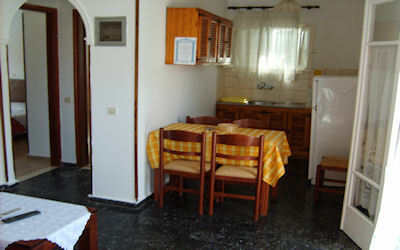 These apartments also have a living area, next to the kitchen. 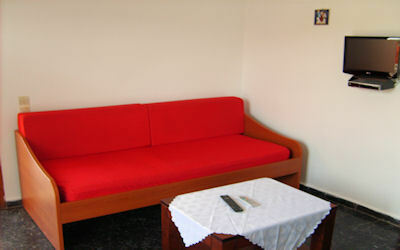 This contains a sofa which can be used to sleep a 5th person. Both bedrooms open onto a Balcony with table and chairs, so you can take drinks and meals outside or simply sit and enjoy the scenery. 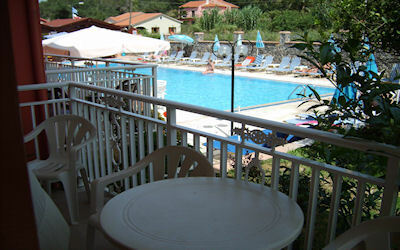 Views from Nafsika are over the Pool and Gardens.